Rescue teams in northern Thailand are giving crash courses in swimming and diving as part of preparations to remove a young soccer squad from a cave in an effort to end a harrowing 11-day ordeal. A team of divers, medics, counsellors and Thai navy SEALS were with the 12 boys and their 25-year-old coach, providing medicine and food while experts assessed conditions for getting them out — a task the government said would not be easy. "The water is very strong and space is narrow. 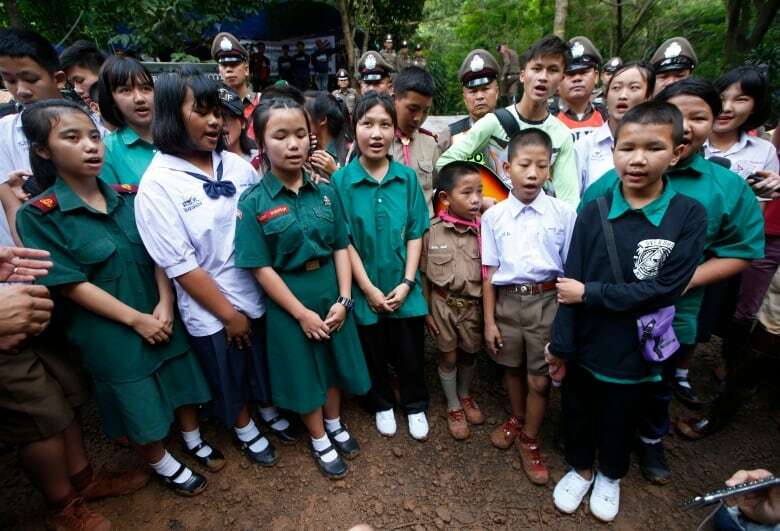 Extracting the children takes a lot of people," Deputy Prime Minister Prawit Wongsuwan told reporters. "Now we are teaching the children to swim and dive," he said, adding that if water levels fell and the flow weakened, they would be taken out quickly. The team was discovered by the SEALS and two British cave diving experts on Monday, having been incommunicado and in darkness since June 23, when a group outing at the caves ultimately led to a high-profile search and rescue effort. A video released by the SEALS on Wednesday showed two rescuers in wetsuits sitting on a elevated part of the cave beside the boys, who are wrapped in emergency foil blankets. They appeared to be in good spirits, occasionally laughing. It was not immediately clear when the footage was taken. A flashlight is shone on each boy, who, one by one, say hello and introduce themselves with head bowed and hands clasped together in a traditional "wai" Thai greeting. Hear how a Canadian who survived being trapped in a cave in Mexico got through the ordeal. In new videos being posted by the Thai navy, the boys are shown wearing a change of clothes and sleeping wrapped in foil warming blankets. A video released late Wednesday morning shows a navy SEAL using antibiotic ointment to treat minor cuts on the feet and legs of the boys. Several of the boys are seen smiling as they interact with the navy SEAL, who cracks jokes. Thai authorities are working with navy SEALs to run a fibre optic internet line into a flooded cave so the boys can talk to their families via phone. Initial efforts to open a communications line between the trapped team located about four kilometres from the mouth of the cave suffered a setback after equipment fell into the water, Chiang Rai Gov. Narongsak Osottanakorn said Wednesday. News that the "Wild Boar" team had survived sparked celebrations and relief in a country transfixed by the drama, with almost blanket media coverage. The rescue teams and volunteers were hailed as heroes in an outpouring of joy and relief on social media, and applauded by the country's prime minister, Prayuth Chan-ocha. 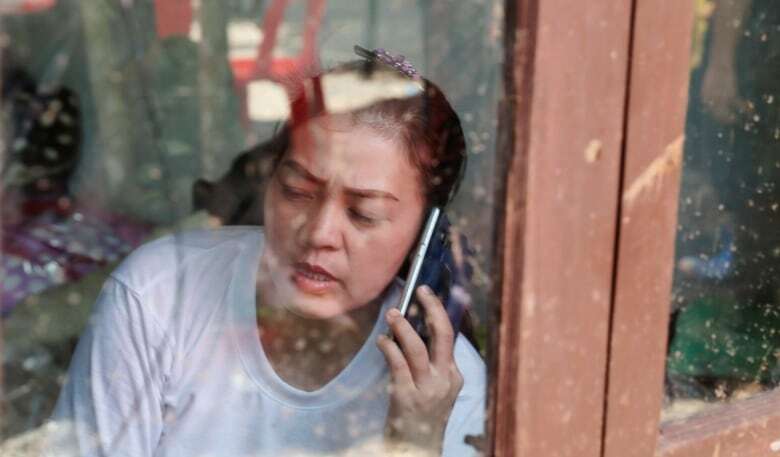 Kian Kamluang, whose 16-year-old son Pornchai is inside, said she had thought there was a 50 per cent chance that her son would be found. "It's like he has been given a new life." She said she'll never let her son go into a cave or near water again. The authorities are keen to get the boys out as soon as possible — but not if it was unsafe. "All 13 don't have to come out at the same time; who is ready first can go first," Osottanakorn told reporters. "If there are risks, then we will not be extracting them." The focus is now on monitoring water levels, rain forecasts and extraction procedures. As of late Tuesday, some 120 million litres of water had been pumped out of the cave. Officials on Tuesday dismissed as speculation reports that the boys could be trapped for up to four months, but supplies have been prepared for that period of time. 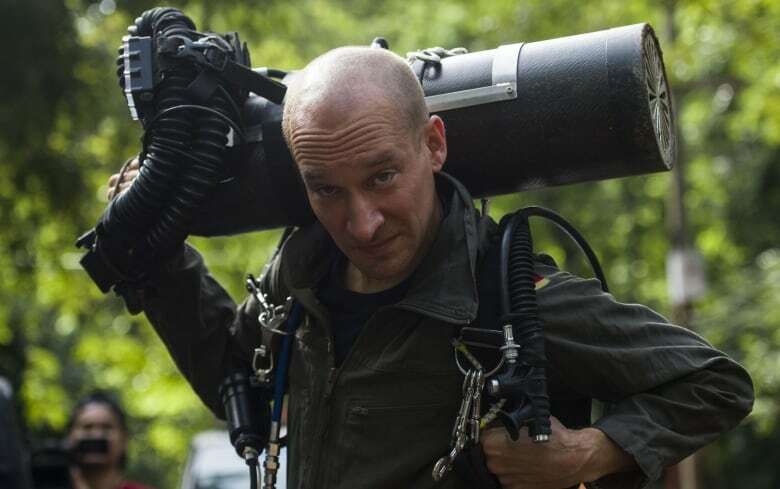 The British Cave Rescue Council, which has members taking part in the operation, said in a statement that "although water levels have dropped, the diving conditions remain difficult and any attempt to dive the boys and their coach out will not be taken lightly because there are significant technical challenges and risks to consider." Gary Mitchell, the group's assistant vice-chairman, said getting out of the cave requires about a kilometre of diving in total, though not all in one stretch, and takes about three hours. "There's air pockets along the way," he said. "It's confined spaces. It's almost zero visibility. There's currents to battle against in places as well. So it's a really quite a strenuous environment to be in," he said. 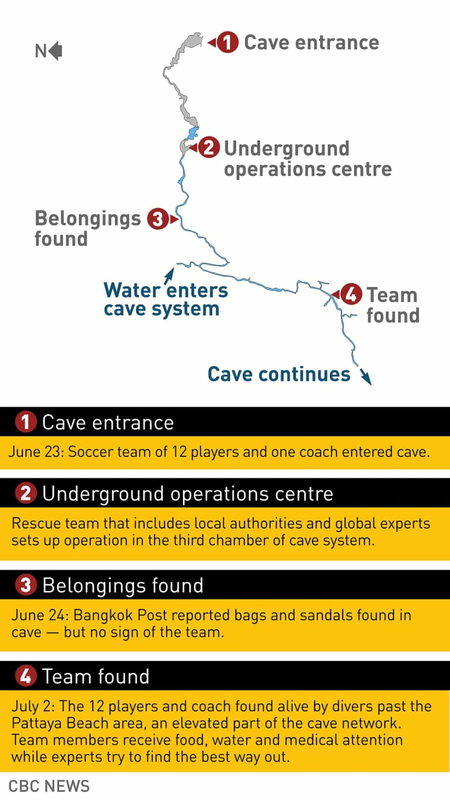 The Thai official overseeing the rescue operation of a soccer team trapped in a flooded cave says the boys and their coach may not all be extracted at the same time depending on their health. He said the team is currently recuperating. Check out this map to see how the team got in — and get a sense of how hard it will be to get out.